Ostara blessings to those in the Southern Hemisphere as we welcome Spring and head towards the warmer months. Blessed Be! This festival is named after the Anglo-Saxon Goddess Eostre, also known in Old German as Ostara. Little is known about this Goddess except that Her festival was celebrated at the Spring Equinox. She was a Goddess of Fertility and was connected with hares and eggs. She may have been a Goddess of the Dawn. She may also be connected with the Greek Eos and the Roman Aurora, both Dawn Goddesses, and with the Babylonian Ishtar and Phoenician Astarte, both who are Love Goddesses. The Spring Equinox is a time both of fertility and new life, and of balance and harmony. Light and dark are here in balance, but the light is growing stronger. It is a time of birth, and of manifestation. The days grow lighter and the Earth grows warmer. At Ostara, seeds may be blessed and planted. Seeds of wisdom, understanding and magikal skills may also be planted. Eggs are used for the creation of talismans, especially for fertility, or ritually eaten. The egg is a symbol of rebirth and its yolk represents the sun, and the white representing the White Goddess. This is a time of both growth and balance, a time to work on balancing yourself. Ostara is a celebration of birth and new life. You will begin to see shoots of new growth and swelling buds on the trees. Energy is building as the days become warmer. This is the time of the official return of the young Goddess after Her Winter hibernation. The young God has now grown into manhood. It is believed that at Ostara the Goddess and the God consummated their love for one another. From this the Goddess became pregnant with the God to be reborn at Yule. The Green Man is very predominate at this time of the year. He is a personification of all life that exist deep within Nature and is usually represented as the foliate mask made up of greenery, leaves growing from mouth and nose, and encircling the face as beard and hair. In some pictures He looks savage, ugly or threatening; in others He is benevolent and watchfully protective. 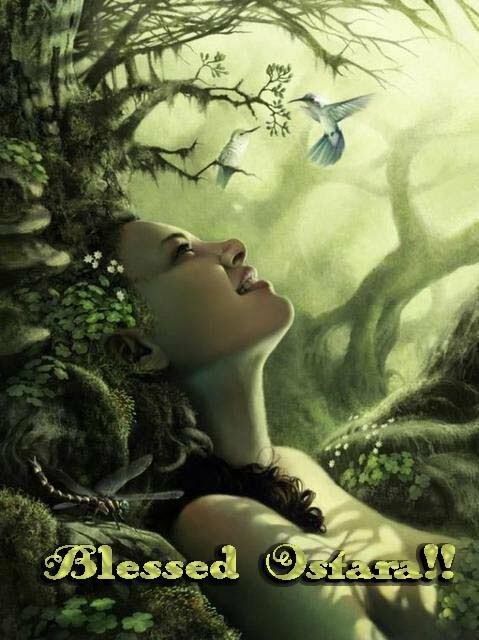 Mabon blessings in the Northern Hemisphere as your season changes towards the cooler months. Blessed Be! Mabon is very much like Thanksgiving. Most of the crops have been reaped and abundance is more noticeable than ever! Mabon is the time when we reap the fruits of our labor and lessons, both crops and experiences. It is a time of joy, to celebrate that which is passing (for why should we mourn the beauty of the year or dwindling sunlight? ), looking joyously at the experience the year has shared with us. And it is a time to gaze into the bright future. We are reminded once again of the cyclic universe; endings are merely new beginnings. Since it is the time of dying sun, effort is also made to celebrate the dead with joyous remembrance. Natural energies are aligned towards protection, wealth, prosperity, security, and boosting self-confidence. Any spells or rituals centered around balance and harmony are appropriate. Also, (from a variation in legend) the Equinox is the day of the year when the god of light, Lugh, is defeated by the god of darkness, Lugh’s twin and alter-ego, Tanist. The night conquers day. The tales state that the Equinox is the only day which Lugh is vulnerable and the possibility of his defeat exists. Lugh stands on the balance (Autumn Equinox-Libra) with one foot on the goat (Winter Solstice-Capricorn) and the other on the cauldron (Summer Solstice-Cancer). He is betrayed by Blodeuwedd, the Virgin (Virgo) and transformed into an Eagle (Scorpio). Two events occur rapidly with Lugh’s defeat. Tanist, having beaten Lugh, now takes over Lugh’s place both as King of our world and lover to the Goddess Tailltiu. Although Tanist now sits on Lugh’s throne, his official induction does not take place for another six weeks at Samhain, the beginning of Winter, when he becomes the Dark King, the Winter Lord, the Lord of Misrule. He mates with Tailltiu, who conceives, and will give birth nine months later (at the Summer Solstice) to her son, another incarnation of Tanist himself, the Dark Child. Many blessings for Mabon here in the Southern Hemisphere as we come into Autumn and the earth and trees begin to change. Blessed Be! The bitter and the sweet collide at the festival of Mabon. It is at once a time to give thanks for the bounty you have created in your life – and a time to grieve for the little deaths we all must endure to truly be alive. When the wheel of the year turns each year to Mabon, or the lesser sabbat of the Autumn Equinox, it is time to give thanks for whatever has come to fruition over the past year. Be it a new relationship you nurtured from raw beginnings, something you made, built, studied or created, any goals once desired and now attained must be honoured. This is your chance to acknowledge the combination of your creative energy and the natural order, both of which helped you to grow this year. The purpose of paying this respect is twofold. Firstly, the acknowledgement of change brought about by the power of your will brings symbolic closure to a phase. That in turn will leave you free to move forward. Secondly, honouring your achievements establishes magical growth as a soul principle – and positive reinforcement will give you the incentive we all need to make positive changes in the future. Processing this soul development at Mabon means you show the Goddess that you actively value enriching and nurturing yourself as a spiritual being in the Craft. This in turn, will bring you more blessings during the coming months. Mabon brings equilibrium; the second time in the entire year when this happens (the other is at the spring equinox). Though Mabon’s light is as long as its dark, from this time forth that light will begin to shorten. With the lengthening of the night comes the increasing power of your own shadow self. Thus Mabon is the beginning of the wisdom of dark mysteries, of wise blood, of premonition, divination and facing your shadow. Working through any negativity that arises is actively promoted at Mabon. Don’t be afraid of working through your own darkness – it’s important to honour and respect your anger, your mistrust, your depression, your sorrows. We learn nothing from denial and repression – we need to engage with our shadow self and give it healthy expression. But before your shadow self absorbs the light, it is vitally important for you to ready your psyche and your body for the intense crone energy that will grow more powerful each time the earth turns from Mabon forth. How will you know when you are being affected by this energy? Even though you can pinpoint the turning of the earth into its flat zone with modern technology (and good astronomy sites!) there are plenty of seasonal signals that the sun god is dying. Watch for migrations of animals, particularly the birds, falling leaves, golding of the leaves, flowers becoming less abundant, the ground becoming colder and harder to the touch, and morning’s getting a distinct chill on them. The energy begins to go within in order to preserve itself. Personally you may find you look back, withdraw, feel aloof or confused regarding your relationships. You may feel less generous than you normally do, and you may also be nervous about any debt you may have accumulated over summer. You might feel it’s time to clean up your act – both in terms of your health and in terms of who you are. It’s a fortuitous time to clear energy in your house – sort of the reverse of spring-cleaning. This clean-up is to make ready for the colder nights coming, to acknowledge that the bare landscape has its own beauty and lessons – as well as a mental clarity and deep wisdom of experience that can be difficult to achieve during Beltane’s sensuous haze, and Litha’s youthful joy. This is older, wiser, deeper, sadder – and somehow more beautiful. Prepare to snuggle into it and delve into your own shadow side in comfort. It’s essential to give thanks for bounty. Write down on a piece of parchment all you have achieved. If you like, use russet-red ink on coppery autumn leaves – I love doing this. Write down on each leaf something you felt you really mastered. It can be a small thing – to others – or a great success. It can be a relationship that you gained closure with – and this is a good time to remember any pain you may have gone through. This could also be a time for letting go. This is the phase of the natural year in which the earth goddess Demeter learned that although her daughter would be returned to her for six months of the year, she also was told that Persephone had eaten six seeds of the underworld fruit, the pomegranate, ensuring her daughter would be forever linked to Hades and live underground for six months. This is the beginning of Persephone’s departure from her mother’s home to return to her husband and the underworld, and thus the start of Demeter’s wild grieving. It was her grief that turned the earth cold, and it was the approaching winter that forced the people of the land to gather their second and last harvest of the year. Those who didn’t would be forced to confront the realities of a barren earth, perhaps without enough stores to get them through. Here is a very special spell. I developed it over a period of about one year, during which a very close friend endured a painful separation, and divorce, which had many ramifications on her relationship with her daughter. (This spell can be adapted to suit any situation – a job ending, a friendship changing, a household breaking up – or simply, then end of summer. It can even be used for an actual death, though I sincerely wish that none of you will have need for it in that regard.) Whatever you use it for, remember it is a spell to help heal the pain of parting, to help you deal with the whirlwind of emotions separation can inspire. It will plug you into the Goddess energy of Persephone and Demeter – two mother and daughter deities who know all about leaving each other – and leaving lovers. It’s also a great spell to perform if you’re experiencing tension between your family and your lover. And, as a mother, I can imagine no greater suffering that the separation from a child. Even though Demeter knows Persephone will return, her anguish is such that her mourning brings increasing cold to the earth. But it also means that the life energy goes underground to become strong again – which yours will do. Grieving takes time. But with this spell, when the wheel next turns, we can be sure to be progressing through our sadness into a new era in our lives. It will help you avoid the tragic state of being stuck in a situation and in emotions of a situation that is dead. • Within the sacred circle, pour the earth into the pot and charge it with healing energy. • Still in the center of your circle, take your clay and forge two figures. These little people now represent you and the person or the situation that you are moving away from. Pour your emotions into them. Do not judge them, do not hold back, but do not let them own you. • Now, bury your little people deep in the earth. • Cover the figures completely with the earth, and feel the relationship moving into the past. • Now, move your energy back to that of the crone. Meditate on moving on, and how best you can manifest that goal. When you feel the power peak, take a pen and write down everything you would like to achieve over the following year. • Once this is completed, ask the Crone to bless your plans and ask for her wisdom to guide you in manifesting them. • Finally, take your little lemon verbena tree, and plant it on top of the figures you have out in the earth. Water it with some water from your cup. Know that life is a wheel, that as there is sadness, there will be joy. That as there is growth, there is the dying off. That the past, with all its sadness, can feed a better future. Close you circle by walking widdershins round it. Place your magical pot plant somewhere you can see it – NOT beside your bed. Somewhere you can see it but not obsess over it. Nurture the plant and notice its growth – this is your emotional and psychic progress made living green symbol. Over time, the clay figures to become one with the earth, and nurture the roots of the plant. This is the symbol that signals to you that there can be a natural, organic end of a relationship. At some time it will become indistinguishable from the earth itself. And the earth itself can bring forth new life. There is only one question. Are you ready to let go? You will know you have absorbed this relationships’ wisdom into your life, strengthening your very soul, when you can drink tea from the leaves of the verbena tree you planted. You will know how hard you are holding on if you are tempted to dig up the clay figures. If you do dig them up, wait till the next waning moon, and repeat the spell. But do not repeat your mistakes. Ostara blessings to all in the Northern Hemisphere as you say goodbye to winter and bask in the glory of Spring with all her wondrous beauty and colour. Blessed Be! Many blessing on Ostara for all here in the Southern Hemisphere as we begin to feel the warmth on our skin and the sun shines through the clouds. To everyone in the Northern Hemisphere I wish you a blessed Mabon as the cooler days come your way. Mabon blessings in the Southern Hemisphere, as we begin to come into winter, with warm toasty fires, and crisp winter days. Blessed be! 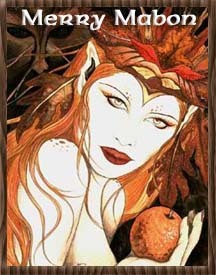 Mabon, is the Autumn Equinox. The Autumn Equinox divides the day and night equally, and we all take a moment to pay our respects to the impending dark. We also give thanks to the waning sunlight, as we store our harvest of this year’s crops. Wiccans celebrate the aging Goddess as she passes from Mother to Crone, and her consort the God as he prepares for death and re-birth. And to the Northern Hemisphere, I wish you a blessed Ostara as you come into Spring and the warmer weather wraps you in her embrace. Blessed Be! To us in the Southern Hemisphere I wish you a blessed Ostara as we move into Spring. And to those in the Northern Hemisphere I wish you a blessed Mabon as you leave winter behind and change season. The tale of Mabon (Modron), also known as the Son of Light, is celebrated. The Equinox is also the birth of Mabon, from his mother Modron, the Guardian of the Outerworld, the Healer, the Protector, the Earth. Mabon was taken after he was a mere three nights old (some variations of the legend say he is taken after three years). Through the wisdom of the living animals — the Stag, Blackbird, Owl, Eagle and Salmon — Mabon is freed from his mysterious captivity. All the while Mabon had rested within his mother’s womb; a place of nurturing and challenge. With strength and lessons gained within the magikal Outerworld (Modron’s womb), Mabon is soon reborn as his mother’s Champion, the Son of Light, wielding the strength and wisdom acquired during his captivity.